Just days after the historic Westminster meeting on West Papuan self-determination, there was more historic support for the people of West Papua as yesterday Solomon Islands Prime Minister Hon. 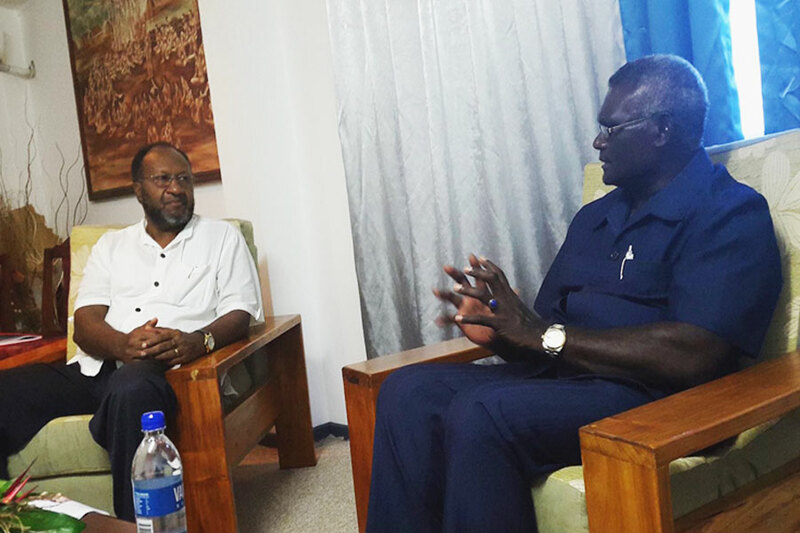 Manasseh Sogavare announced that he had met with Vanuatu Prime Minister Hon. Charlot Salwai and that together they had reaffirmed their backing for The United Liberation Movement for West Papua – ULMWP. (Last week, the governments of both Vanuatu and the Solomon Islands sent delegations to Westminster, UK to attend and support the meeting of the International Parliamentarians for West Papua – IPWP). The Prime Minister of Vanuatu, Hon. Charlot Salwai (left) meeting with the Prime Minister of the Solomon Islands, Hon. Mannaseh Sogavare (right) yesterday. Prime Minister Hon Sogavare also took the opportunity to acknowledge the intention by the Vanuatu Prime Minister to move a motion at the upcoming MSG Leaders’ Summit for the elevation of the United Liberation Movement of West Papua’s (ULMWP’s) membership of the MSG from Observer status to Full Membership status. “Your decision for the motion touches my heart and has my full support. I hope that our other colleagues will throw in their support behind this important agenda,” he said. Prime Minister Salwai also acknowledged the Solomon Islands Government position on the issue of West Papua and the assurance of support by Prime Minister Sogavare for his proposed motion for the elevation of the ULMWP’s membership of the MSG. He said he would be meeting with the FLNKS spokesman, Mr Victor Tutugoro when he travels to Noumea next week about the motion to in an effort to also secure his support. A delegation from the United Liberation Movement for West Papua (ULMWP) also met with Solomon Islands Prime Minister Hon. Manasseh Sogavare in Port Vila yesterday and briefed him on the deteriorating situation in West Papua. Prime Minister Sogavare said the fresh accounts of an ever-increasing rate of genocides in West Papua relayed to him by the delegation in their meeting with him only confirms the ongoing stories of atrocities committed against West Papuans for the last 50 years. Solomon Islands Prime Minister Hon. 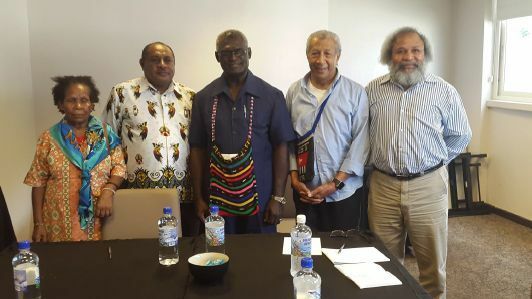 Manasseh Sogavare meeting with members of the United Liberation Movement for West Papua (ULMWP). He was presented with a traditional West Papuan string-bag (bilum). On the issue of urgent UN intervention in West Papua, Prime Minister Sogavare said Indonesian President’s apparent rejection of the resolution reached by the Pacific Islands Forum leaders in Port Moresby in 2015 for the deployment of a fact-finding mission in West Papua as well as the Indonesian President’s refusal to meet with him in his capacity as the MSG Chair to explain the position of the MSG on the issue of West Papua are very strong grounds warranting the MSG to take the matter up to the next notch which is the United Nations. He said Indonesia was granted Associate membership of the MSG to allow for dialogue between Jakarta and the MSG Leaders on the issue of West Papua and the Indonesian President’s refusal of my request to meet with him regarding MSG’s position on West Papua is a clear indication that it has another reason for joining the MSG. We would like to convey our deepest thanks and encouragement once again to Hon. Manasseh Sogavare, Prime Minister of the Solomon Islands and Hon. Charlot Salwai, Prime Minister of Vanuatu for their consistent solidarity and compassion for the people of West Papua and the struggle for self-determination. Such true Melanesian solidarity is unbreakable and the people of West Papua are filled with hope and gratitude at the strong, unwavering support that is increasingly being shown to them and their cause from right across Melanesia.